Life is unpredictable, subhanallah (“Glory be to God”, said when you’re impressed by something). Sometimes you’re trying so hard to reach a specific point in life and although you keep pushing persistently it won’t work. It won’t work because it’s not the time yet. And because something else was planned for you, something that comes to you so easily, you won’t understand how and why. After that awesome weekend I have told you about in my last blog entry I am so very happy to announce that some (a few) artworks of mine will be displayed at the Museum of Arts and Crafts in Hamburg for two years! In the course of the reconfiguration of the Islam section, my works will be displayed as part of the contemporary art collection. This is a great honour for me! Love that they chose Rumi’s quote for the invitation cards: “Beyond right and wrong there is a field. I’ll meet you there“. Whoever is interested in visiting the opening (11-15:00 on April, 12): Just let me know. 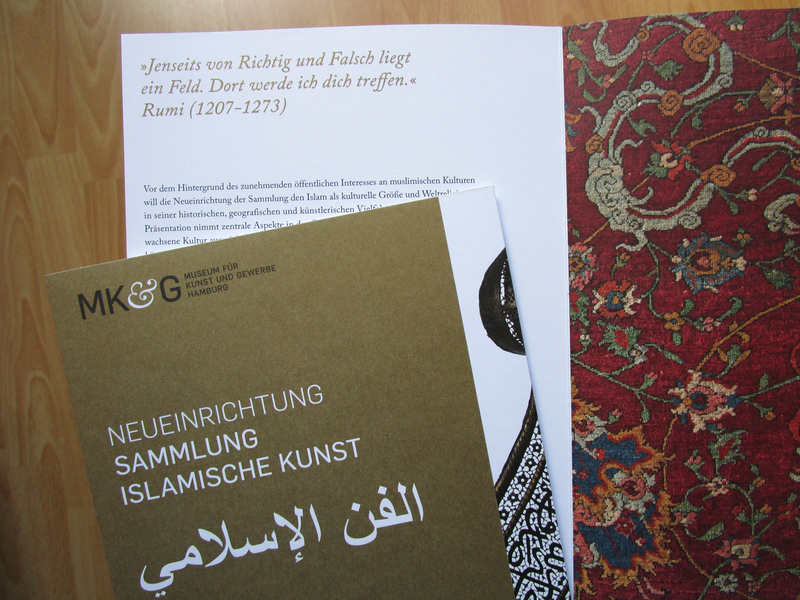 There will be some oriental-jazz and short lectures about Islamic art.